SFB corps de ballet dancer Miranda Silveira in Athleta. Photo Courtesy Athleta. Just in time for Nutcracker season (and the cold weather that has us layering on our coziest warmups), fitness brand Athleta teamed up with San Francisco Ballet for their first Athleta Dance collection. Available beginning November 27, the capsule collection will include designs in women's and girl's sizes inspired by and created in collaboration with the dancers of SFB. Of course, this isn't the first time a major athletic wear brand has teamed up with professional ballerinas. Under Armour has now launched two collections with American Ballet Theatre principal Misty Copeland, and most recently, Royal Ballet principal Francesca Hayward created limited-edition designs with Lululemon. The Royal Ballet principal has joined the cast of Universal Pictures and Working Title's film adaptation of the Andrew Lloyd Webber musical Cats. Photo by Nathan Sayers. The Royal Ballet's Francesca Hayward is no stranger to collaborations outside of the dance world. The principal ballerina has modeled for Vogue (on more than one occasion), created her own clothing line with Lululemon, and up next, she'll star in the film adaptation of the Andrew Lloyd Webber musical, Cats. Officially joining the ranks of ballerinas-turned-designers is The Royal Ballet principal dancer Francesca Hayward. Working with Canadian activewear brand Lululemon (whose leggings earned them a cult following), Hayward will be releasing a limited-edition collection on October 9. "The feel, it's amazing against my skin; the way it fits my body, the position that everything sits at has been especially designed between us," Hayward told ELLE UK. "And I love the colors, too. That was my problem with dancewear before, it wasn't that the fabrics didn't feel good but they just weren't me. They were pink and flowery, and so stereotypical. I just think let's move forward and not be so old fashioned. I don't need to be a pink ballerina," she said. Hayward in her Lululemon collection Principal Dancer Funnel Neck Sweater. Photo via Lululemon. Onstage This Week: Justin Peck Makes His Vail Dance Fest Choreographic Debut, Two Premieres at American Contemporary Ballet, and More! Patricia Delgado in Pam Tanowitz's "Solo for Patricia 2017." Photo by Erin Baiano, Courtesy Vail Dance Festival. Wonder what's going on in ballet this week? We've pulled together some highlights. With half a month devoted to creating new art in the midst of stunning nature, Vail Dance Festival seems a dancer's paradise. Last week marked American Ballet Theatre's festival debut. The second week of performances, starting July 30, brings even more amazing ballet, with dancers and choreographers presenting a slew of new collaborations and premieres. Get the scoop on each program below. July 30-31, Alonzo King LINES Ballet presents two different programs. The first performance, is a free, family-friendly event held in the Avon Performance Pavilion. The second, held at the Gerald R. Ford Amphitheater, presents two works by King: Sand, a piece from 2016 set to jazz music, and Biophony, an exploration of the Earth's diverse ecosystems. We love seeing dancers pop up in mainstream media, and Royal Ballet principal Francesca Hayward just made the ultimate crossover in British Vogue's "Five Favourite Objects" series. Naturally, most of Hayward's picks are ballet-related (she even still has the Nutcracker VHS her grandparents gave her at three years old!). In between clips of Hayward practicing in the studio, she shares the importance behind each favorite thing, from the obligatory rehearsal tutu and pointe shoes to the less-expected stuffed animal she never travels without. Stella Abrera at the Genée International Ballet Competition in 1995. Photo by Pete Jones, Courtesy Royal Academy of Dance. On September 7, The Genée International Ballet Competition—the Royal Academy of Dance's flagship event—gets underway in Lisbon, Portugal. Founded in 1931, the Genée recognizes top talent with medals and cash prizes, as well as exposure to company and academy directors. Competitors perform a classical variation, a commissioned piece by an emerging choreographer, and a "Dancer's Own" solo, choreographed by either the competitor, their teacher or a peer. The 10-day competition, which hosts young dancers trained in the RAD syllabus from around the world, has helped launch the careers of many of today's ballet stars. Just who, exactly? Take a walk down memory lane as we reveal eight familiar faces. This week, there's a whirlwind of dance in the Windy City. The annual Chicago Dancing Festival, celebrating its 10th anniversary this year, opened last night at the Auditorium Theater with glittering performances by the Joffrey Ballet, Martha Graham Dance Company, Pennsylvania Ballet and Daniel Ulbricht’s Stars of American Ballet. The festival continues through Saturday, with performances held at multiple theaters and parks across the city. While all shows are free, tickets for indoor performances went on “sale” in late July—and sold out fast. Lillian Di Piazza and James Ihde in Concerto Barocco. Photo by Alexander Iziliaev, via PA Ballet. Francesca Hayward as Juliet. Photo by Alice Pennefather, Courtesy ROH. But don't worry, Chicagoland ballet lovers: No tickets are required for the festival’s outdoor Dancing Under the Stars program, held at Jay Pritzker Pavilion in Millennium Park on August 27. The evening includes the Joffrey Ballet in Christopher Wheeldon’s After the Rain, Pennsylvania Ballet in George Balanchine’s Concerto Barocco and Hubbard Street Dance Chicago in William Forsythe’s One Flat Thing. Newly minted Royal Ballet principal Francesca Hayward and soloist Marcelino Sambé will be there, too, dancing the pas de deux from Sir Kenneth MacMillan's Romeo and Juliet (a role Hayward talked about in our February/March cover story). The show also includes Chicago Dancers United, a collective of local dance companies which work in tandem with Dance for Life, to raise funds for critical health issues like HIV and AIDS. They'll be performing in a new work by Chicago-based choreographer Randy Duncan. The festival closes with Rennie Harris' Students of the Asphalt Jungle, performed by his hip hop company, Rennie Harris Pure Movement. Stake out a spot early—the performance starts at 7:30 pm, but fixed seating at the Pavilion is first come, first serve. There is also lawn seating available. For more information, click here. 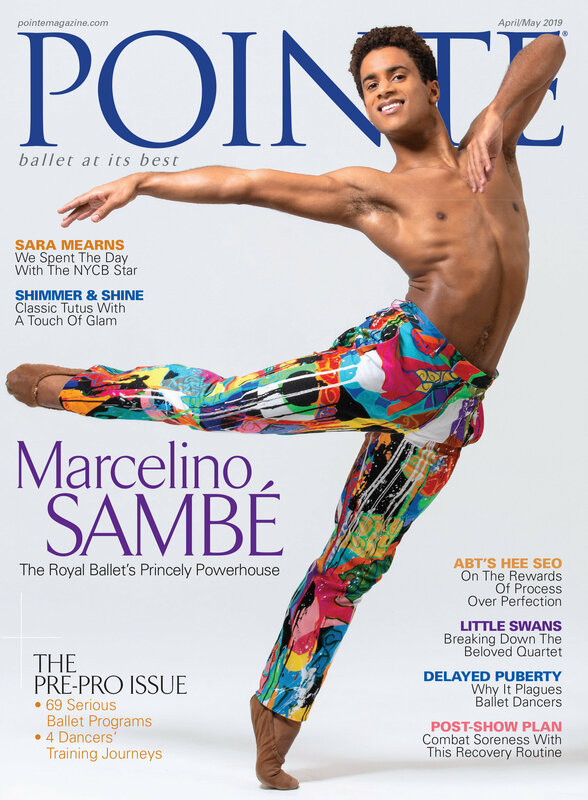 Two Pointe cover stars, two Japanese dancers and a woman who rocketed through two ranks in one year are among the dancers newly promoted to The Royal Ballet's highest ranks. With artistic maturity far beyond her 23 years, we knew it was only a matter of time before Francesca Hayward, who we featured in our February/March 2016 cover story, rose to the top. She'll start next season as a principal along with Alexander Campbell, Ryoichi Hirano and Akane Takada. With these newly promoted dancers, The Royal's principal roster reflects more diversity. Hirano and Takada, both Japan-born, came to The Royal Ballet fresh off of Prix de Lausanne triumphs. Campbell is a native of Australia and Hayward, who grew up in England, was born in Nairobi to a Kenyan mother and a British father. Yet while there's been much public interest in her African heritage, she's more vocal about her English training. In our February/March issue, Hayward told writer Laura Cappelle, “It's only when people ask me what it's like to be a mixed-race dancer that I realize that I am. I've never been made to feel different, or like I shouldn't be doing it." American dancer Beatriz Stix-Brunell (our 2012 October/November cover girl) is a new first soloist. Before joining The Royal, Stix-Brunell was a protégé of artistic associate Christopher Wheeldon. She trained in New York and at the Paris Opéra Ballet School, and she joined Wheeldon's Morphoses when she was just a teenager. Claire Calvert and Yasmine Naghdi are also newly appointed first soloists, and Matthew Ball and Mayara Magri have been promoted from first artist to soloist. English dancer Tierny Heap was promoted to first artist in the middle of the 2015/2016 season. She danced the title role in Carlos Acosta's Carmen among other featured roles, and artistic director Kevin O'Hare evidently decided that Heap needed even greater tests for her talents. She will start the 2016/2017 season as a soloist. See The Royal's website for a full list of promotions, new hires and departures. Francesca Hayward photographed by Nathan Sayers for Pointe. This is Pointe's February/March 2016 Cover Story. You can subscribe to the magazine here, or click here to purchase this issue. Last September, as one of The Royal Ballet's coaches walked her through the potion scene from Romeo and Juliet, Francesca Hayward wasted no time marking the steps. Instead of lingering on individual poses, she was instantly focused on the web of emotions behind the choreography. Sitting on Juliet's bed, she seemed to contemplate the events that had just unfolded as Prokofiev's music swelled up, projecting despite her tiny stature; after pretending to drink the poison, she reached for her neck, her eyes filled with fear and disgust. When The Royal Ballet first soloist made her debut in Sir Kenneth MacMillan's iconic ballet the next month, British critic Luke Jennings tweeted: “Francesca Hayward dances Juliet and British ballet is remade." At 23, the Kenya-born dancer is the leading light of a rising UK-trained generation nurtured by director Kevin O'Hare. She is also a rare mixed-race ballerina on the path to stardom, but neither she nor UK audiences have paid that fact much heed. Instead, Hayward has become known for embodying quintessential Royal Ballet qualities: fleet-footed articulation, sparkling musicality and strikingly natural acting. Born near Nairobi to a Kenyan mother and British father, Hayward left Africa when she was 2. She was raised by her paternal grandparents in Sussex, not far from London. When they bought her ballet videos, she was instantly hooked; she vividly recalls mimicking Alessandra Ferri's own potion scene as Juliet in her living room. “I was fallen on the floor and doing all the dramatic bits. My grandpa looked into the living room and thought I was really ill."
Choreography is filled with tricky moments, and sometimes even the simplest steps or sequences can cause the most trouble. (Think of the countless hours you spend perfecting your pliés.) Whether you're trying to capture just the right accent or refine a technical detail of a movement, watching a dance video played back in slow motion can be a helpful tool for identifying what's difficult to pin down in real time. Enter Royal Ballet soloist Francesca Hayward. In this short video from the Royal Opera House, she demonstrates the "Fred Step," a famous string of movement that often appears in Sir Frederick Ashton's choreography. Several slightly different versions have been seen in his Cinderella, A Month in the Country, Symphonic Variations and other iconic works. Here, Hayward performs a variation on the classic phrase (arabesque, fondu, coupé, petit développé, pas de bourée, pas de chat), leaving out the pas de bourrée. Her fluidity is stunning and her technique impeccable, but overall, it's just plain fun. Happy dancing!